Patented mounting brackets that are stronger than suction allow you to install this towel bar in almost any location, and hang up to 20 pounds. The friction mount system gives you a non-permanent install that looks and feels as if it were cemented in place, or stuck to the wall with screws. There are no tools necessary to hang it up, and installation only takes a matter of seconds, but once in place, you will have a great looking towel rack that won't slide, spin or fall off under weight. It's perfect for folks living in an apartment, dorm or rental house because it doesn't leave behind marks or holes, but anyone else that wants a quick and simple way to add storage can also benefit from this remarkable product. It sticks to nearly any bathroom surface, so use with confidence on tile, fiberglass, mirrors, acrylic, glass and more. As an added bonus, the mounting brackets are completely reusable. Just peel off and re-position if you decide you want in a different spot. Shattered glass, broken tiles, permanent holes and other annoyances are all avoided without any compromise to sturdiness or utility. This towel bar will look and function just like one that takes several screws and hours of sweating to install, but it goes on in a matter of seconds, and can come down, or move, in the same short amount of time. The friction mount brackets are way stronger than suction, and they also look better and last longer too. Made from a thinner material, They are able to grip better because they stick flush to the surface, and all air and moisture is eliminated. Instead of sliding while holding something heavy, or falling off for no reason several days down the line, this bar will remain sturdy and secure in the exact spot you choose. Despite the incredible hold, no sticky substance is utilized, and there is no hardware of any kind required. Install this product in places never before possible, but don't worry about flopping, slipping, or that cheap look that suction cups guarantee. Any smooth and shiny material is compatible with this bar, so anyone will have several options for placement in their bathroom. Because it would also be useful in other rooms, stick on smooth surfaces in your kitchen, laundry room or closet to add storage there too. It mounts in a matter of minutes, and installs in locations that other products would only destroy. Use it to add a washcloth rack to a glass door, or mount it on the tile right outside your shower to grab a dry towel without dripping on the floor. No tools or hardware are required for install, and it does not use glue, so no residue will be left behind either. The brackets will hold tight to anything glossy, and the set comes with adapter sheets to allow for install on other materials. Will not work on surfaces that normally resist suction like drywall and wood. Excited about the way it works, but not excited about the way it looks? We also carry a stainless steel version with modern styling so if you want a bar that will better match your bathroom decor, check out our Stainless Steel Friction Mount Towel Bar. No glue, no licking, no screws and no hassle. Installation could not be more simple. Stick this bar almost anywhere because it will not harm any surface, and it comes off completely if necessary. Once in place, the rack will hold up to twenty pounds, so saturated linens will not be a problem. Installation only takes a few minutes, but follow the steps below for best results. To begin, select location. The surface should be compatible, but also freshly cleaned. Use the included template to determine spacing and alignment for the brackets. Check for level to ensure a good install. Most people will not need the included adapters, but for surfaces where it is recommended, peel off the backing and apply those first. Smooth out any air bubbles. 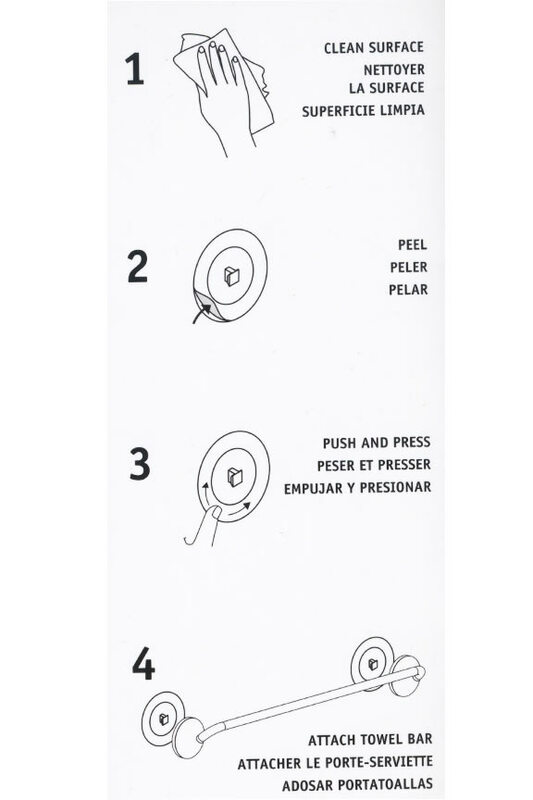 To apply each bracket, simply peel off the backing and press into place. This bar uses two brackets, one on each end. Apply firm pressure to mount, and then massage to smooth air toward the outside. Remove all visible bubbles by sliding them out. 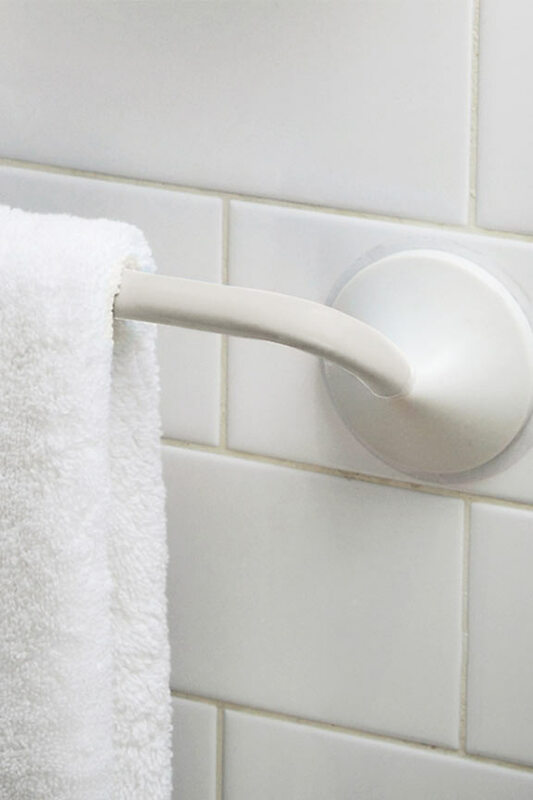 Attach towel bar to mounting brackets by sliding into place. Position bar above the mounting circles, and then slide down onto center posts. Compatibility Perfect for nearly any bathroom surface. Use on smooth surfaces like glossy tile, acrylic, fiberglass, stainless steel, glass and more. Includes adapter sheet for matte tile and certain metals. Will not work on drywall or porous wood. A towel bar that installs anywhere! Perfect for rental properties, or anyone that wants to have storage in a more ideal location. No hardware or tools necessary, and no sticky stuff or holes left behind if you move it. Looks like a suction cup, but performs way better. Order Yours Today. Wanted this to drain my tub mat after my shower. Works like a dream. MY mat dries quickly, ready for the next morning! Quite sturdy - no issues with it coming off the shower wall. Glad I found out about it! This towel bar is great. It is just what you need if you if you are in a place where you can't use screws or if you might want to relocate the towel bar to another location. Very easy to install. I found that the suction cups alone did not keep the towel bar on the tile. It kept slipping off. BUT with a little Gorilla Glue applied to the suction cups, it now seems to be holding well. I still prefer using this friction mount towel bar with Gorilla Glue than to drilling holes in my tile. So with a little help, this can be a good solution. The product (when it is not factory defective), is very ingenious and extremely useful. We have shower with glass walls and cannot drill holes to put in towel racks. This product fits the bill perfectly and definitely fills the need. But I cannot give it 5 stars, much though I'd like. The manufacturer quality is cheap and very frail. We first bought a couple, and within a couple of weeks the cheap plastic bar wobbled and no longer clicked and stayed in place with the anchors. By the time I called the seller to request replacement, the warranty had expired. We bought a couple more (after all, the price really is cheap, which makes the problems a mere inconvenience, rather than a rip off). Here too one of the two were defective in exactly the same way, while the other remains firm and working perfectly. We bought three more (we wanted to give a couple as a gift, and keep the thrid to replace the previously deffective one). Guess what, one of the three was also deffective in exactly the same way. So, doing the math, we bought 7 units and 3 were unusable (about 40%). The ones that weren't defective or frail work like a charm. So if we do the math, we paid (from memory) about $15 each. That means we paid about $105 for four fully functioning towel racks: That works out to about $26 per rack, which is still a decent price considering that they meet a definite need and even at $26, the price is OK. Fix the quality control issues, and I'd give the product 5 stars, because the ones that work really work perfectly. simplygoodstuff response: Sorry to hear of the defective units you encountered. If you receive one from us, please let us know right away, and we'd be happy to help you resolve the problem. I ordered this towel bar to mount on the inside of one of my sliding shower doors because it was missing a bar to close the door. It was very easy to install. It has been on my shower for about a month now and it is still securely mounted with no signs of it becoming loose or falling off. I am completely happy with this product. Good value too for the price. Exactly what I needed. Easy to install, holds tight. The concept is good, but the implementation leaves a lot to be desired. First of all, the parts don't mate very well. The round plastic part does not click into the round sticky part very well, forcing me to push down on the stick part, which causes it to come out. The towel bar is also too short. It can fit a towel about 17" wide, and I measured my other towel rack which can fit a towel 23 inches wide. All of my towels are too wide to fit this towel rack. I suggest NOT buying this bar if you intend to put it on the outside of the shower door on glass that has an uneven surface. I've been a fastidious handyman for about 40 years (and having earned a living doing so)and could not make this item function. If your application is similar to mine, call a glass shop and have them drill holes in the glass for a permanent towel bar of your choice! This towel holder is perfect for our new bath enclosure. After showering, everyone wadded their washcloth up and left it on one of the little built-in shelves. Now all the wet washcloths hang on this little rack. I'm not a "handyman" at all, but I followed the instructions and had it on the wall in less than 10 minutes. It's been up for about a month now - still holding tight. Very pleased with it! I purchased this towel bar to mount in my shower/tub. I use it to hang a mat to keep it dry (in between showers). Product installed easily and so far appears more than capable of doing the job. Looks great. Exactly what I was looking for. I have a large tiled shower and use a regular bath tub mat on the floor to keep firm footing. I needed a way to hang the long mat up to dry after each shower to avoid any mildew or other problems. The 13' tiles have a matte finish. The towel bar, with the matte finish adaptors included, attached easily and firmly to my shower wall. Now I just hang the wet mat over the towel bar in the shower and it dries between showers as well as the floor. Works Great. Thank you for allowing all of the reviews that were posted by your company. They helped me enormously in making a decision to go with your company. We love our new towel bar. It's been up since day one with no problems!! Great product and awesome customer service to work with ..Thank You!! I am going to return this item, because it is really not white, but rather ivory, and it doesn't look good against my really white acrylic tub. The quality seems ok, but the color is not right. These friction mount towel bars would not adhere to the smooth acrylic walls of our "American Standard Ciencia" shower walls. However, using the supplied adapter sheets on the surface, then applying the friction mounts worked very well. They have been in place for about 3 weeks, and are holding well. Thanks for a good mounting solution. Towel bar for the shower is exactly what I was looking for - don't hesitate - good product. A little tricky to hang. The towel bar is the perfect size, but even using the template, it was a little tricky to hang. I needed to use the clear stickers on the wall and still, one side fell off every time I used it for about 2 weeks. I just kept rehanging it, and, I'm not sure why, but now it stays up and works great. I have had some problems with this towel bar. First, the packaging was iron clad so it took some doing to get it out of the package - totaling ruined any chance of return. 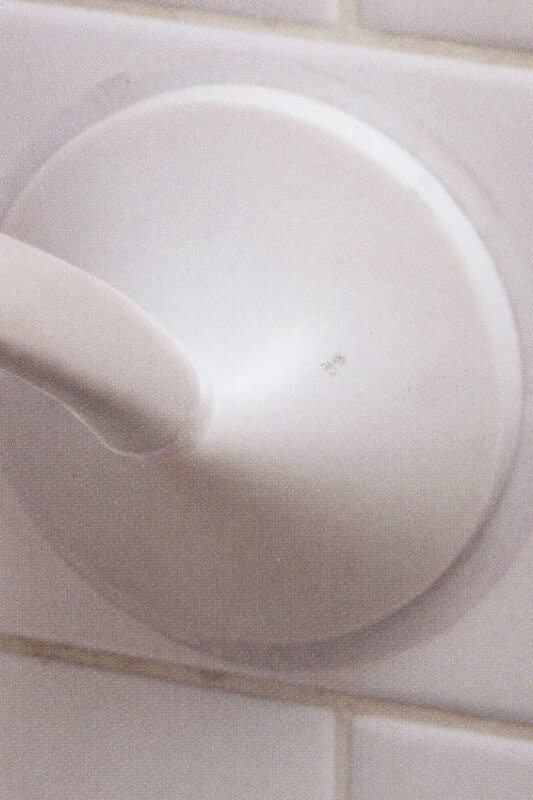 Secondly, the mounting plastic piece stays on the wall, but the "click-on" mechanism of the bar comes off when you pull the towel up and off. I have to hold the left side of the bar while lifting the towel. Cannot seem to fix this at all. Decided if it continues I will use one of the "Command" stick-on's as extra reinforcement. Positive review is that it fits the spot and does not require any drilling or permanent mountings. If it would just stay on, I'd be happy. The towel bar is very attractive and was very easy to install with the template provided (and no holes had to be made in the tile). Works fine holding a washcloth. It is attached to an acrylic bath/shower wall surround. After 3 weeks, it is not showing any weakness nor indication of coming down. The towel racks are functional and doing what I hoped they would - (holding towels without falling off the walls). I like the design. The only down side is the price. I think it's a bit pricey for a product that is all plastic. Will this bar stand up to water? I would like to use inside shower for washcloths. Thanks. Yes it does. Wet or dry, it will hold strong without fail. Use it inside or outside of your shower. i need a bar that is 18" in length. is this bar 18 from end to end, or, are you also adding in the size of the cups, which would shorten the actual size of the bar? The usable portion of the bar is 18". The total product dimensions are more like 21". You should be in good shape. How about a wider towel bar like this, like 30 inches to 33 inches? At this time, one does not exist. Does this come in stainless steel? I'd like to use the product on Travertine Tile....therefore, would I need an adaptor...and if so, do you supply or sell the adaptor. Also, is there a video I can view re installation? Adapter sheets come with the bar. Installation is pretty simple. There is a quick visual how to in the video you can find to the left of the product image. We also list instructions in the description, and directions with pictures will come with the product. Can this be used on regular painted sheet rock walls? It would depend on the paint and level of texture, but in most cases, it's not recommended for use on sheet rock walls. What is the spacing on the brackets? Can I mount it on 6' a glass block wall? The spacing of the brackets is nearly identical to the usable length of the bar. It's roughly 18". Does the bar come in chrome or stainless steel? No chrome, but we do carry a stainless version here. Does this come in clear or any other color besides white? At this time, white is the only color option for this model. We do have a stainless steel version that may suit your needs. Will the adapter work on textured vinyl wallpaper? It will depend on the finish and degree of texture. In general, the smoother the surface, the better the results. Can this bar be applied to inside wood cabinet door? If the finish is smooth enough, then yes, it should work just fine.